In animal models of conotruncal heart defects, an abnormal calcium sensitivity of the contractile apparatus and a depressed L-type calcium current have been described. Sarcoplasmic reticulum (SR) Ca2+ ATPase (SERCA) is a membrane protein that catalyzes the ATP-dependent transport of Ca2+ from the cytosol to the SR. The activity of SERCA is inhibited by phospholamban (PLN) and sarcolipin (SLN), and all these proteins participate in maintaining the normal intracellular calcium handling. Ryanodine receptors (RyRs) are the major SR calcium-release channels required for excitation-contraction coupling in skeletal and cardiac muscle. Our objective was to evaluate SERCA2a (i.e., the SERCA cardiac isoform), PLN, SLN, and RyR2 (i.e., the RyR isoform enriched in the heart) gene expression in myocardial tissue of patients affected by tetralogy of Fallot (TOF), a conotruncal heart defect. The gene expression of target genes was assessed semiquantitatively by RT-PCR using the calsequestrin (CASQ, a housekeeping gene) RNA as internal standard in the atrial myocardium of 23 pediatric patients undergoing surgical correction of TOF, in 10 age-matched patients with ventricular septal defect (VSD) and in 13 age-matched children with atrial septal defect (ASD). We observed a significantly lower expression of PLN and SLN in TOF patients, while there was no difference between the expression of SERCA2a and RyR2 in TOF and VSD. These data suggest a complex mechanism aimed to enhance the intracellular Ca2+ reserve in children affected by tetralogy of Fallot. Human conotruncal heart defects are congenital heart defects (CHD) affecting the cardiac outflow, including the muscularized conus and the adjacent truncus arteriosus, collectively termed the conotruncus (1). Frequent conotruncal defects are tetralogy of Fallot (TOF), interrupted aortic arch, transposition of the great arteries, double-outlet right ventricle, persistent truncus arteriosus, and aortic arch anomalies (2). A specific neural cell crest population, named cardiac neural crest, is responsible for the morphogenesis of the outflow region of the developing heart (3) and conotruncal heart defects are due to alterations in the neural crest (NC) migration (2). Microdeletion of 22q11 is the most frequent chromosomal anomaly associated with conotruncal defects (4). Animal models of conotruncal defects were created by NC ablation, providing a powerful model of cardiovascular dysmorphogenesis (5). Findings in animal models suggest that the cardiac NC influences the development of myocardial Ca2+ channels. Indeed, a decrease in L-type Ca2+ current was found in ventricular myocytes after cardiac NC ablation (6). Moreover, an impairment of sarcoplasmic reticulum (SR) function was observed, supporting the hypothesis that poor viability of embryos is due to impaired cardiac excitation-contraction coupling (3). Ryanodine receptors (RyRs) are considered to be the actual calcium-release channels of SR (7). The function of RyR2 (the cardiac isoform) is to allow the calcium-induced calcium release that brings about contraction, while myocyte relaxation results in RyR2 closure accompanied by the Ca2+ re-uptake into SR through the SR Ca2+/ATPase pump (SERCA) (8). SERCA2a represents the main regulator of cytosolic calcium in the heart (9). Its activity is regulated by phospholamban (PLN) and sarcolipin (SLN) (8). Unphosphorylated PLN inhibits SERCA2a by lowering both its apparent Ca2+ affinity and SLN regulates SERCA2a by lowering Ca2+ affinity and reducing Vmax, as well as by inducing a super-inhibitory effect of PLN to SERCA2a (8). To clarify the relationship between congenital heart defects (CHD) and myocardial calcium handling in humans, we evaluated SERCA2a, RyR2, PLN, and SLN gene expressions in children with tetralogy of Fallot (TOF), a conotruncal defect, as well as in those affected by ventricular septal defects (VSD) and atrial septal defects (ASD), which are non-conotruncal malformations. Tetralogy of Fallot is characterized by the presence of a malalignment of VSD with overriding aorta, variable degrees of right ventricular outflow tract obstruction, and right ventricular hypertrophy. Patients with TOF usually have moderate-to-severe cyanosis due to right-to-left shunt across the VSD and, when present, the ASD. The right atrium is usually thicker than normal and dilated, due to pressure overload (10). In contrast, the right atrium of patients with an isolated VSD does not suffer, at least in theory, the effect of any hemodynamic burden. However, patients with significant left-to-right shunt across the VSD usually have significant left atrial dilation, with consequent left-to-right shunt across the stretched foramen ovale and mild-to-moderate right atrial dilation (11). On the other end of the spectrum, patients with isolated ASD usually present with moderate-to-severe dilation of the right atrium, because important left-to-right shunt across the atrial septum is a prerequisite for addressing patients to surgical correction. To our knowledge, the present study is the first work specifically dedicated to evaluation of the gene expression of SERCA2a, PLN, SLN, and RyR2 in different types of congenital heart disease in children. In particular, our semiquantitative analysis of gene expression has been performed using calsequestrin (CASQ) as the housekeeping gene. Calsequestrin is a calcium storage protein of the SR with unchanged expression on mRNA and on the protein level in heart failure (12). Its expression has been found unchanged in both animal models of cardiac hypertrophy in heart failure and patients with cardiovascular disease (12–20). It has been chosen as the housekeeping gene in previous studies on gene expression (12,20). We enrolled 46 children undergoing surgical correction of congenital cardiac defects (CHD). Informed consent was obtained from parents. Of the patients, 23 had tetralogy of Fallot (TOF), 13 had isolated secundum type atrial septal defect (ASD), and 10 had a non-conotruncal, isolated ventricular septal defect (VSD). Patients with malalignment of VSD (a conotruncal malformation) were excluded, as were patients with associated cardiac lesions other than patent foramen ovalis and patients with a known genetic disorder. Clinical and demographic characteristics of the patients enrolled in the study, divided according to CHD, are reported in Table 1. A small tissue sample was obtained from the right atrial appendage, which is routinely purse-stringed and opened during venous cannulation for cardiopulmonary bypass to provide fast and safe access to the right atrium. The samples were immediately frozen in liquid nitrogen and then stored at −80°C until analyzed. a Echo data were available for all patients. F, females; RA, right atrium; RAP, right atrium pressure; RVP, right ventricle pressure. A patent foramen ovalis (PFO) was considered to be present when described in the echo referral or in the surgical report In 17 out of 18 patients with TOF and PFO, a right to left shunt was present. In the latter the shunt across the PFO was bidirectional. Five patients with VSD had a left to right shunt across the PFO. bThe right atrium was described as “enlarged” by the surgeon in all 46 patients. Echocardiographic data are reported in the table. cPreoperative cardiac catheterization was performed in 12 (52.1%) patients with TOF, 3 (30.0%) patients with VSD and 5 (38.5%) patients with ASD. In ASD patients, cardiac catheterization was always performed in concomitance with an attempt at percutaneous closure of the defect. Total RNA was extracted from each specimen by OMNIZOL (Euroclone, U.K.) in a procedure based on the guanidinum thiocyanide method (21). RNA extracted (400 ng) was then added to a mixture containing 250 ng of random examers (Gibco BRL Life Technologies, MD, USA), 2 µL of 5× RT buffer (Promega, Madison, WI, USA), 0.5 µL of dNTPs (1.25 mmol/L concentration of each Pharmacia Biotech, NY, USA), 5 units of RNasin (Promega, Madison, WI, USA), and 20 units of M-MLV RT (Promega, Madison, WI, USA) and water up to a final volume of 10 µL. The retrotranscription was carried out at 42°C for 1 h.
The housekeeping gene calsequestrin (CASQ) and the target gene cDNAs were coamplified in a multiplex PCR, using 2 pairs of specific primers. The sequences of the used primers are listed in Table 2. Primers for the SERCA2a, PLN, and CASQ were designed by Primers! software, while those for the RyR2 and SLN genes were designed by Autoprime software (https://doi.org/autoprime.de). Primers were chosen in different exons, or at least one primer of each couple was designed at two consecutive exons borders so no genomic DNA, eventually contaminating the RNA solution, was amplified. The specificity of each primer was verified by the Basic Local Alignment Search Tool (BLAST) (https://doi.org/www.ncbi.nlm.nih.gov/BLAST/). Presence of primer dimers, as amplified product length, were verified by the software Amplify 1.2. The PCR solution total volume (20 µl) contained 1 µL of the 1st strand cDNA solution, 1 µL of 1.25 mmol/L dNTP, 2.0 µL of 10× PCR buffer, 0.4 µL of 50 mmol/L MgCl2, 0.125 units of EUROTAQ (Euroclone, U.K.). The reaction mixture was brought up to a final volume of 20 µL with RNase-free distilled water. Primers annealing temperature, MgCl2 concentration, and number of amplification cycles varied according to reaction (Table 1). Two separate PCRs were performed from the same RT. Five µl of the PCR products were separated on a 8% polyacrylamide gel (19:1 acrylamide-NN methylene-bisacrylamide) and Silver stained. The density of the products was analyzed by the NIH Image 1.60 program developed at the U.S. National Institutes of Health and available on the Internet (https://doi.org/rsb.info.nih.gov/nih-image/). In particular, the results were calculated as follows: first, the densities of the bands in the scanned gels, corresponding to the PCR products of the target genes, were obtained by the mentioned software according to the user instructions; second, the ratio between the target gene and CASQ band densities obtained for each sample has been calculated. The image is converted into greyscale. Standard statistical analyses were carried out using the Stat-View 5.0.1 program (1992-98, SAS Institute Inc., SAS Campus Drive, Cary, NC, USA). Because gene expression values do not seem to be normally distributed, both original (with non-parametric tests) and the logarithmic transformed (with parametric tests) data were used for statistical analysis. Since parametric and non-parametric tests resulted in the same statistical trends, we have reported only the results of the parametric tests. In particular, for comparisons between two independent groups the unpaired t test was used (Figure 1), while differences among more than 2 independent groups were analyzed by ANOVA after log-transformation of original data (Figures 2–5). The Scheffè analysis was used as a post hoc test after ANOVA because this test is the most conservative and robust to violations of assumption (such as non-normal distribution of experimental data). The results were expressed as the mean ± SE values in the text (if not otherwise stated), and p value was considered significant when < 0.05. Distribution of gene expression values of SERCA2a in patients divided according to the congenital cardiac disease. The 10th, 25th, 50th (median), 75th, and 90th percentile of gene expressions are indicated with boxes (i.e., 25th, median, and 75th) and lines (i.e., 10th and 90th). The values (outliers) above the 90th percentile and below the 10th are indicated as circles. The results of the Scheffè test after ANOVA were also reported. ASD = atrial septal defect, VSD = ventricular septal defect, TOF = tetralogy of Fallot. Distribution of gene expression values of PLN in patients divided according to the congenital cardiac disease (see legend Figure 1 for values explanation). Distribution of gene expression values of SLN in patients divided according to the congenital cardiac disease (see legend Figure 1 for values explanation). Distribution of gene expression values of SERCA2a in patients divided according to the congenital cardiac disease (see legend Figure 1 for values explanation). Distribution of gene expression values of RyR2 in patients divided according to the congenital cardiac disease (see legend Figure 1 for values explanation). 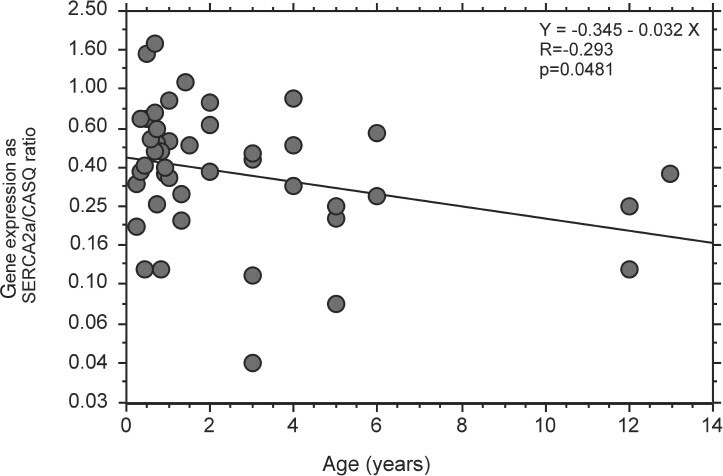 Mean age values were not significantly different in the three groups of patients studied (2.6±0.8 years in TOF, 3.4±0.5 years in ASD and 1.3±0.4 years in VSD, respectively). Univariate analysis showed a slight (but statistically significant) correlation only between SERCA2a gene expression and age (but not with PLN, SLN, or RyR2 gene expression); the linear regression between these two variables is reported in Figure 6. Linear regression between SERCA gene expression (log-transformation of original data) and age. Gene expression was expressed as the ratio between SERCA2a and CASQ gene expression. Data obtained from each target gene or patient were normalized by CASQ expression, considered a housekeeping gene (12,20). Indeed, CASQ expression has been shown to be unchanged during ontogenic development and aging, as well as in hypertrophied myocardium due to pressure overload and thyroid dysfunction (22,23). Gel pictures are illustrated in Figure 7. The data obtained are summarized in Figures 2–5. Polyacrilamide gels of target genes. A standard DNA ladder is loaded into the first lane of each gel. A. Four different samples are reported: 1, VSD; 2, ASD; 3 and 4, TOF; upper bands represent PLN PCR product of 337 bp, lower bands represent CASQ (276 bp). B. Four different samples are reported: 1, TOF; 2, VSD; 3 and 4, ASD; upper bands represent SLN of 568 bp, lower bands represent CASQ (276 bp). 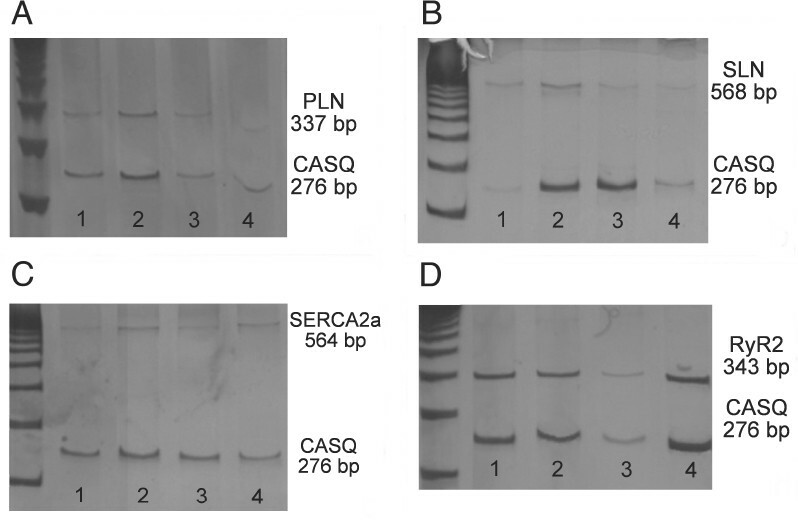 C. Four different samples are reported: 1, ASD; 2, VSD; 3 and 4, TOF; upper bands represent SERCA2a of 337 bp, lower bands represent CASQ (276 bp). D. Four different samples are reported: 1, TOF; 2 and 3, VSD; 4, ASD; upper bands represent RyR2 PCR product of 343 bp, lower bands represent CASQ (276 bp). 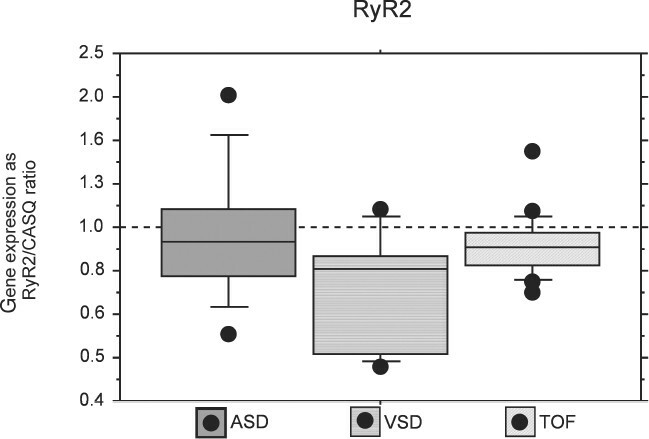 Statistical analysis between the three groups of patients showed a lower expression in ASD (0.39±0.07) than VSD (1.01±0.14) and in TOF (0.33±0.05) than VSD patients, respectively; while there was no significant difference between ASD and TOF patients’ groups (Figure 2). 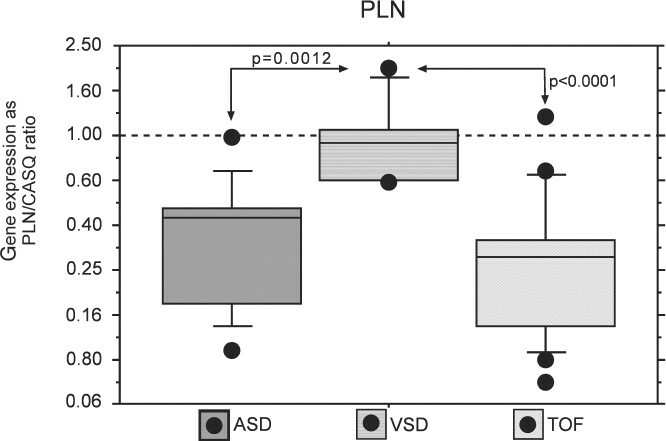 Furthermore, we found no significant difference when comparing values of PLN gene expression in ASD patients with those obtained by grouping the patients with TOF and VSD (0.53±0.08). Statistical analysis between the three groups showed a lower expression in TOF (0.45±0.04) than in VSD patients (0.82±0.14); while no significant differences between ASD (0.66±0.09) and TOF or between ASD and VSD groups were observed (Figure 3). 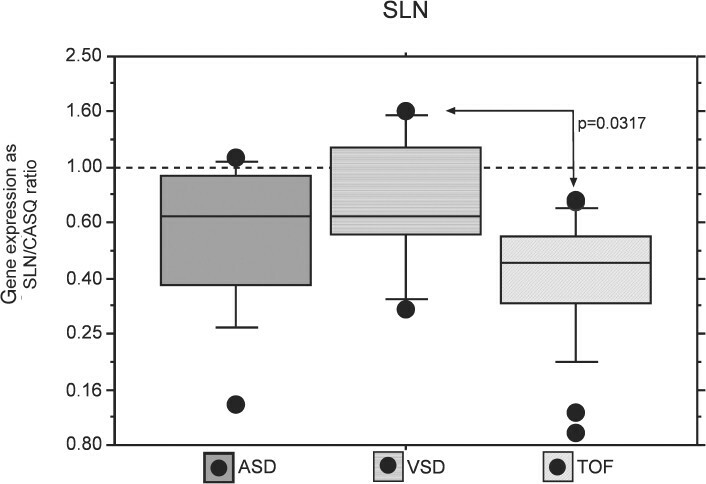 Furthermore, we found no statistically significant difference when comparing values of SLN gene expression in ASD with whole values obtained from TOF and VSD groups of patients (0.56±0.06), respectively. Sheffe’s test between the three groups showed a lower expression in ASD (0.33±0.07) than in TOF (0.56±0.07) patients; while there was no statistically significant difference between ASD and VSD (0.50±0.14) or TOF and VSD groups of patients (Figure 4). 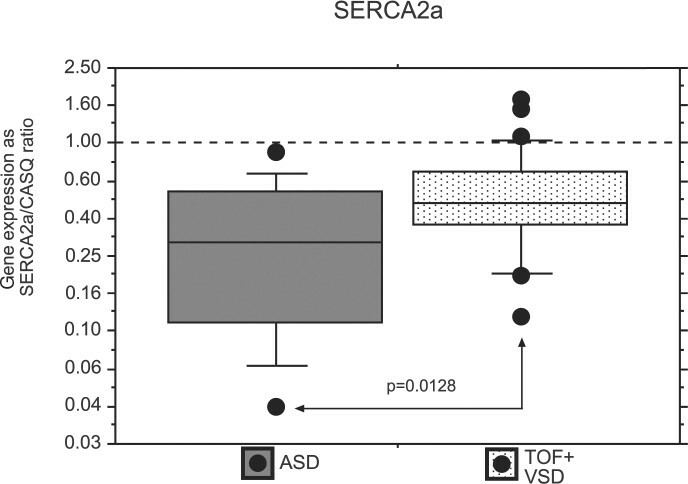 We found a statistically significant difference by comparing values of SERCA2a gene expression in ASD with whole values obtained from TOF and VSD patients (0.54±0.06) (Figure 1). Statistical analysis showed no significant difference between the three groups of patients studied (ASD = 1.02±0.11, TOF = 0.92±0.03, and VSD = 0.76±0.07) (Figure 5). The comparison between ASD and whole TOF and VSD groups (0.87±0.03) also showed no statistically significant difference. Tetralogy of Fallot is a frequent conotruncal heart defect. Indeed, TOF shows a prevalence of 2.6/10,000 live births (24) and accounts for about 5–6% of all CHD in humans (25). According to some previous findings in animal models (3,5,6), we evaluated whether there is an altered gene expression of proteins involved in the contraction-relaxation cycling in cardiac muscle of patients affected by TOF. Shimura et al. reported that SLN, PLN, and SERCA2a gene expressions are decreased in animal models of mechanical stress myocardium (26). Few works have previously investigated the calcium channels’ gene expressions in patients with CHD (9,27). Pavlovic et al. (9) found a reduced atrial mRNA expression of SERCA2a only in the group of infants characterized by volume-overloaded right atrial myocardium compared with the atrial myocardium which was not overloaded. Moreover, these authors found that there was no difference in PLN mRNA expression between the two groups. 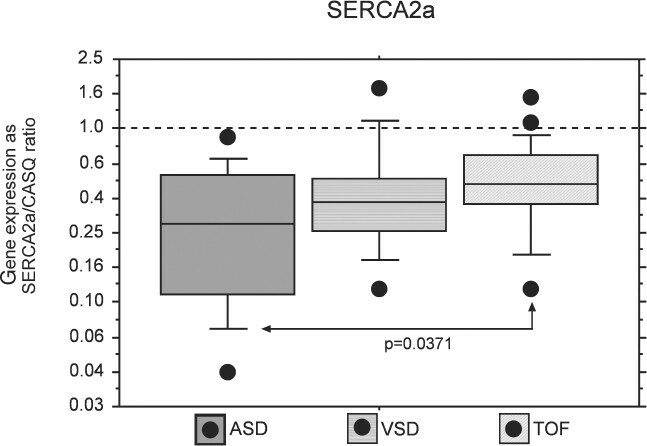 Our data indicate a significant reduction in SERCA2a gene expression in patients with ASD compared with TOF (Figure 4), and ASD compared with the VSD TOF group (Figure 1), while the expression of PLN and SLN genes were unchanged. It is important to note that our data are in agreement with those reported by Pavlovic et al. (9), when the presence of severe atrial overload (observed in ASD, but not in TOF and VSD) is taken into account. Actually, our TOF and VSD patients were not characterized by a remarkable volume overload of the right atrium (Table 1). This could possibly be explained by the unchanged SERCA2a gene expression observed in these last two groups of patients. Indeed, our study indicates an important reduction of SERCA2a gene expression only in patients characterized by volume overload (such as those with ASD), while expression of PLN and SLN genes remained unchanged, as previously reported by Pavlovic et al. (9). Our data show that there is a significantly lower expression of both the PLN and SLN genes in patients with TOF than in those with VSD, while SERCA2a and RyR2 are not expressed differently in these two study groups of patients. Different factors can be involved in the downregulation of PLN and SLN. Among these, hypertrophy and pressure overload observed in TOF patients may play an important role. In transgenic mice, it has been demonstrated that modification of the abnormal calcium handling, through ablation of PLN, protects from the detrimental functional, morphological, and molecular consequences due to chronic β-adrenergic signaling in the heart (28). These data suggest that the lower expression of PLN and SLN in TOF may be considered as a defensive mechanism aimed to protect the heart from the detrimental effects of hypertrophy and abnormal calcium handling (28). A possible factor influencing the gene expression of proteins involved in calcium handling is cyanosis. Indeed, all TOF patients show clinically significant hypoxia (Table 1). However, it is important to underscore that the lower PLN and SLN gene expressions should be considered as part of the abnormal embryological development observed in CHD, when taking into account that TOF is a conotruncal defect. Our data suggest that the gene expression of SERCA2a was found to be unchanged in TOF patients, probably owing to a reduced downregulation of PLN and SLN in conotruncal children compared with VSD patients. This may represent a compensatory mechanism aimed to enhance the intracellular calcium reserve in TOF patients. These data seem to be in agreement with those from animal models suggesting an influence of cardiac NC on the myocardial Ca2+ channels development. This hypothesis is supported by the observation of both a decreased L-type Ca2+ current in ventricular myocytes after cardiac NC ablation (6), and an impairment of sarcoplasmic reticulum (SR) function (3). Limitations of the present study should be taken into account. The major hemodynamic derangements that characterize TOF (and VSD) patients are observed at the ventricular level. Unfortunately, we were not able to collect ventricular tissue samples from our VSD and ASD patients, and we had to limit our gene expression analysis to the right atrial appendage, an easily available source of myocardial tissue that at our institution is routinely excised from the heart during the preparation of the patient for cardiopulmonary bypass. A major limit of our study was the inability to evaluate the protein levels in myocardial tissue because of the limited amount of tissue available and the inability to measure the calcium currents in the myocardial cells. Finally, in the present study, a semiquantitative analysis was performed using the CASQ gene as the normalizer. Taking into account the definition of cardiac hypertrophy, it is theoretically conceivable that all the gene expressions of proteins constitutively regulated (such as all the housekeeping genes) could be upregulated in hypertrophic cardiomyocytes. However, several papers (12-20) reported that CASQ gene expression is unchanged in cardiac hypertrophy and heart failure. However, we believe that this fact does not diminish the interest of our findings: we found a highly significant difference in the expression of both the PLN and SLN genes in patients with TOF than in those with VSD. Even if we are not able to discern, at the moment, whether this difference represents an adaptive response to the hemodynamic burden or an intrinsic part of the congenital defect, we believe that our results add interesting data to what is known about calcium handling in CHD patients. In conclusion, our data suggest that several factors contribute to the calcium channels’ protein gene expression in the heart. This regulation can be ascribed not only to the structural and hemodynamic characteristics of the CHD, but, potentially, also to the embryonic development of the heart defect. It is possible that NC may influence the myocardial Ca2+ channels development and the expression of the proteins involved, even in human beings. The use of array technology to study gene expressions in malformed hearts may be an interesting prospective of future investigations that would allow a better understanding and identification of a more integrated biological message (29,30).